I have recently made two scrappy quilts of different designs. Both are easy and fairly quick to make. The first is a scrappy log cabin style. I started this in a class at our guild a couple of years ago and finally finished the top. I didn’t think I was going to like it because the fabrics were fairly busy, but I followed the instructor’s (Charlie Petersen) advice and put together a mix of prints, solids, and a stripe. I cut a bunch of strips 1 1/2 inches, 2 inches, and 2 1/2 inches wide from all the fabrics. I used three of the solids for the center squares and added the rest of the fabrics as I built the log cabins, making sure I didn’t duplicate the fabrics within a block as much as possible. The blocks go together fast because everything is chain pieced so you add the first piece to the center square for all the blocks, then the second piece, etc. The block ended up 7 inches square unfinished as shown below on the left. The finished quilt top is shown on the right. I was going to add a wider border from one of the prints I had left, but it looked too busy when I auditioned it, so I decided to stop with just the narrow red border. 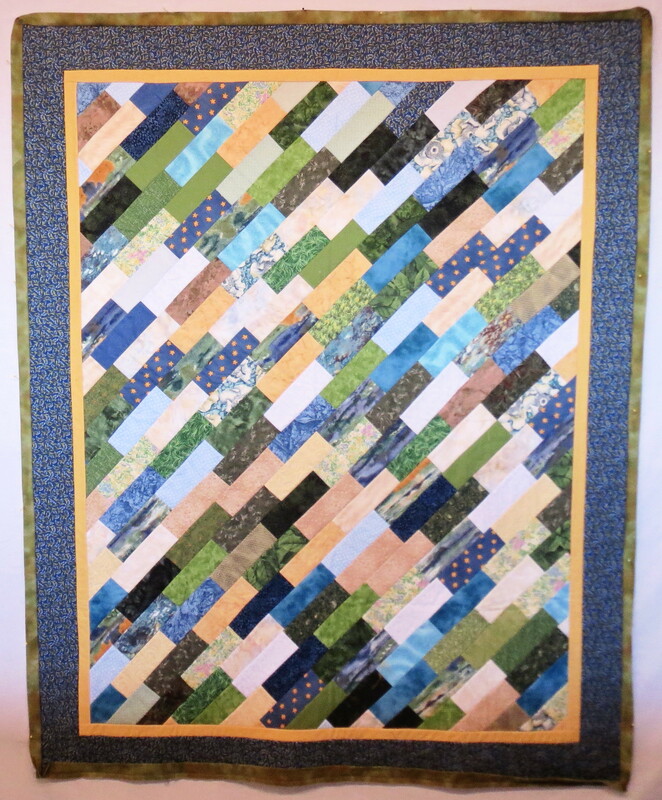 The second scrappy quilt is a “quilt as you go” technique, taught in another guild class this week by Jan Knodle. You cut a bunch of 2 1/2 inch by 6 1/2 inch rectangles from your scraps, join them together end to end to make long multi-fabric 2 1/2 inch wide strips, then stitch the strips to the batting and backing on the diagonal. The basic rectangular shape (without borders) is drawn on the batting first, so you know where the strips are going to start and stop. Each row is applied and cut off the long roll at the edges. The first strip is laid right side up and the second strip is laid right side down on top of the first, the seam is sewn through both strips and the batting and backing, the second strip is turned to the right side. Then a third strip is applied on top of the second, and so forth. I selected a blue/green/yellow color scheme because I owned a large piece of quilt back fabric in those colors and wanted to use it up. Another guild member used a monochromatic color scheme in golds and browns, which was very elegant looking. Regardless of the color choices, all the quilts looked great. 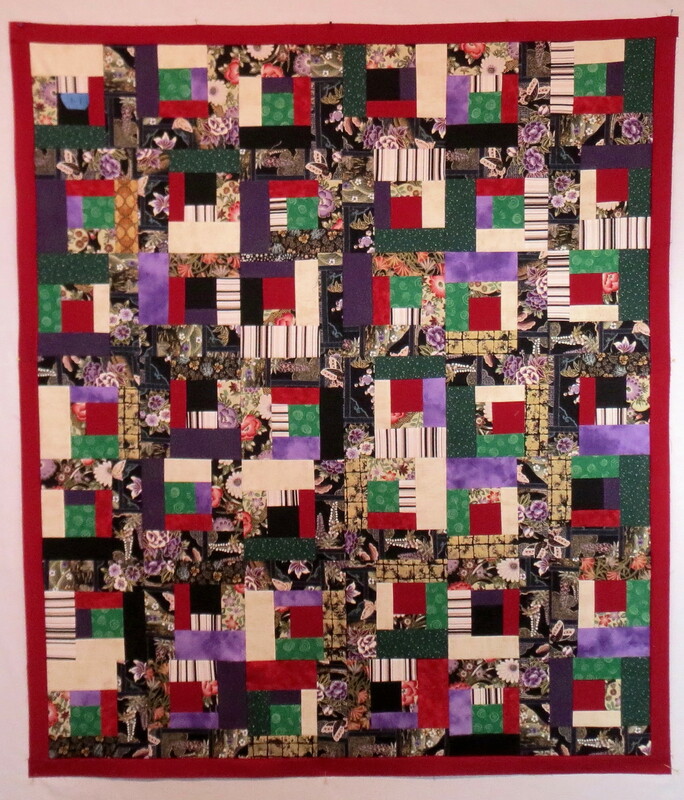 This entry was posted in Quilting on August 21, 2013 by Shirley at Mystery Bay Quilt Design. Oh no, thanks to you I now have ANOTHER project. I was about to donate that huge bag of small pieces of fabric to Linus but will just have to try out Jan’s quilt with the 6″ strips sewn together. Wonder how it would look with a full assortment of different color fabrics? It will be a new Arizona project. Yes, Anne, I think I feel the same way. I still have piles of scraps of many colors. I haven’t seen it done with all colors rather than selecting a few. 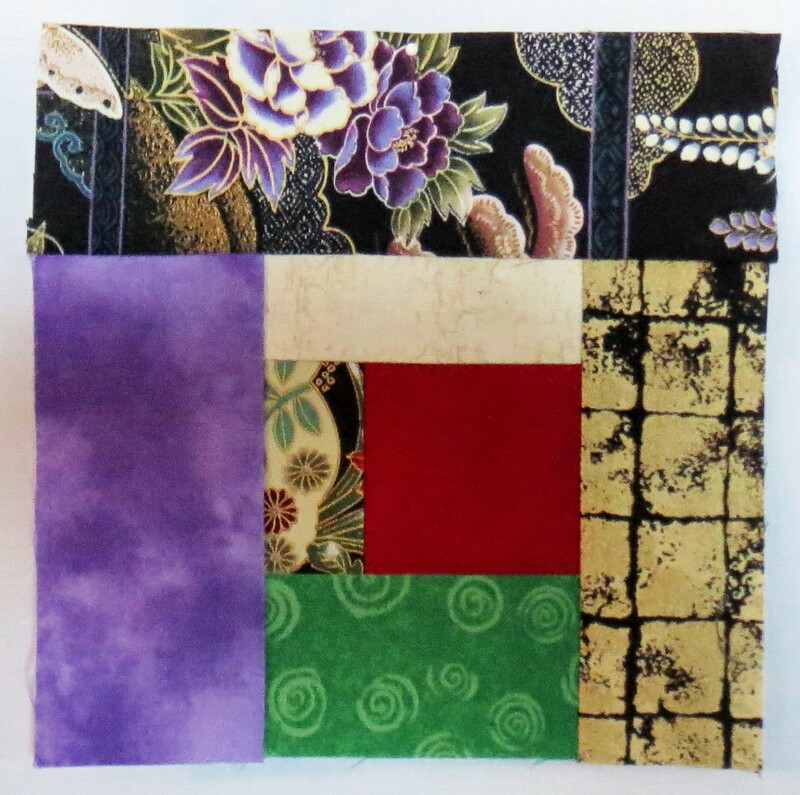 Try out a placemat or tablerunner size with many scraps before you commit to a big one. Lots easier to handle that size any way and you will see how you feel about the technique. Do the math to figure out how many pieces you need: a 20 inch by 40 inch table runner is 800 square inches; a 2 1/2 by 6 1/2 cut piece finishes to 2 x 6 or 12 square inches. So for the 20 x 40 runner you need 800 divided by 12 or 67 pieces. Be sure to cut a few extra because of the diagonals. If you finish a multicolor one, send it to me and I will upload it here to my blog so we can all see how it looks!